I won't present Gilles Peterson. The guy is not a producer, probably not the best DJ around but he has acquired a near legendary status thanks to his fantastic ears, the record labels he created (Acid Jazz, Talkin' Loud, Brownswood), his club nights, his BBC Radio show and his compilations. 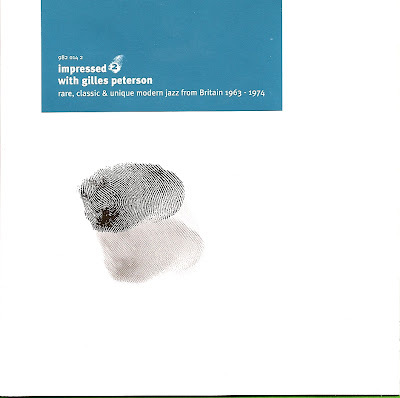 Impressed 2 explores a scene staid relatively unknown and unexplored, the British jazz scene of the 60's and 70's. At the time, Great Britain was busy reinventing rock&roll and his jazz artists staid in the shadows of fame. Of course, all the gems gathered on this compilation are just excellent and it would have been a real shame to keep Michael Garrick Septet, The Stan Tracey Quartet, The New Jazz Orchestra or Tubby Hayes & The Paul Gonsalves All Stars only in rare groove diggers vinyl collection.